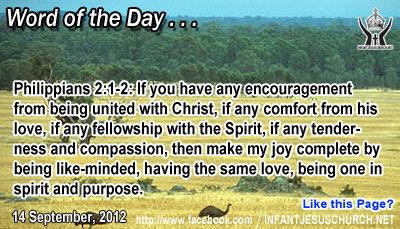 Philippians 2:1-2: If you have any encouragement from being united with Christ, if any comfort from his love, if any fellowship with the Spirit, if any tenderness and compassion, then make my joy complete by being like-minded, having the same love, being one in spirit and purpose. Heavenly Father, you have blessed us so richly in Jesus with his presence. Open our eyes to see how those around us in our spiritual family need to receive those same blessings from us. In the name of Infant Jesus, and because of the grace he has lavished upon us, we pray with thanksgiving in our heart. Amen. Today’s Gospel tells us that God's love has no bounds or limits. His love is not limited to one people or a few chosen ones. His love is boundless because it embraces the whole world and each individual created in "his image and likeness". God is a unrelenting loving Father who cannot rest in anticipation of all of his wandering children have come back home to him. Saint Augustine says, God loves every one of us as if there were only one of us to love. God gives us the liberty to choose whom and what we will love and not love. Jesus shows us the impossibility of love and forgiveness and judgment and criticism. We can love the darkness of sin and non-belief or we can love the light of God's truth, goodness, and compassion. If our love is guided by truth, goodness, and that which is truly striking, then we will choose for God and love him above all else. What we love shows what we wish. Do we love God who is the supreme good above all else? And do we seek to put him first in all your thoughts, cares, choices, and actions?